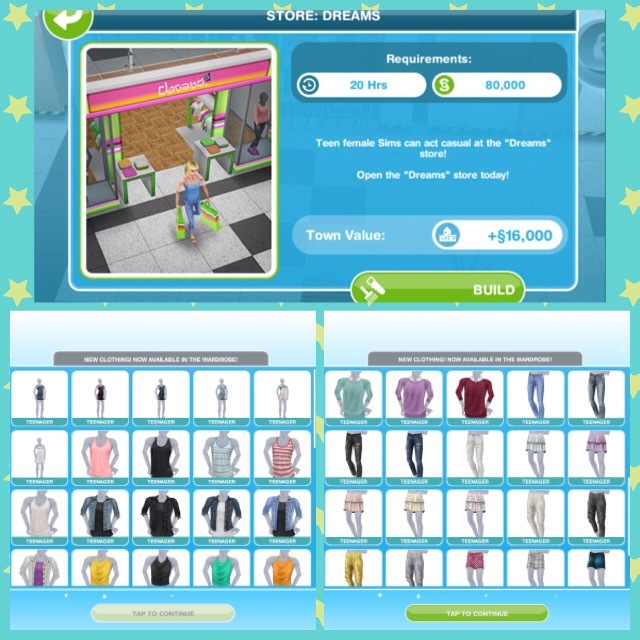 Once you update your game to the Pregnancy update you will be able to build the maternity store! 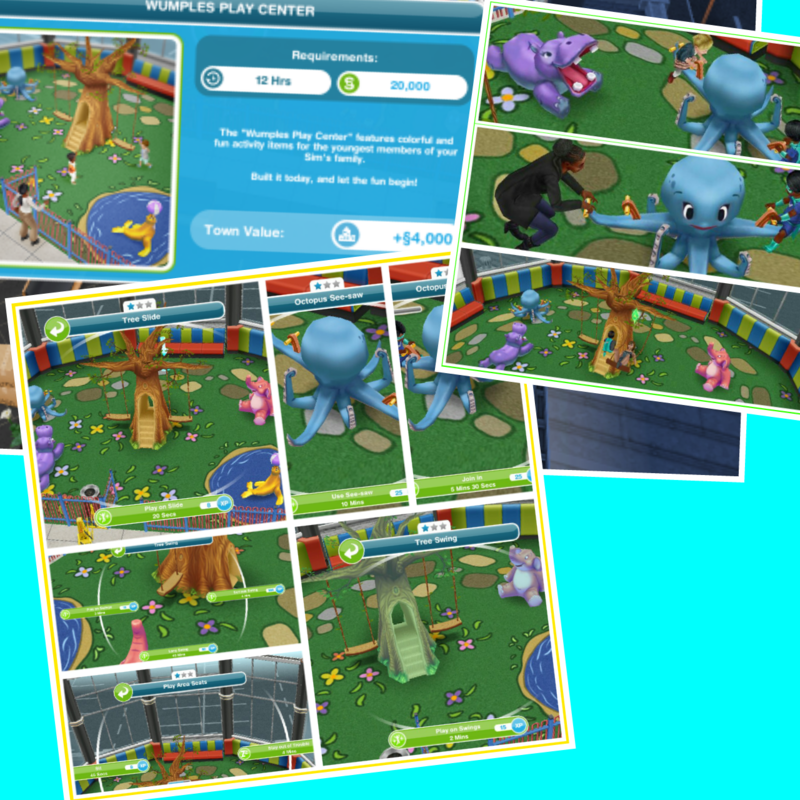 Once built the A Bump-y Ride Quest will begin- complete this quest to unlock Pregnancy! 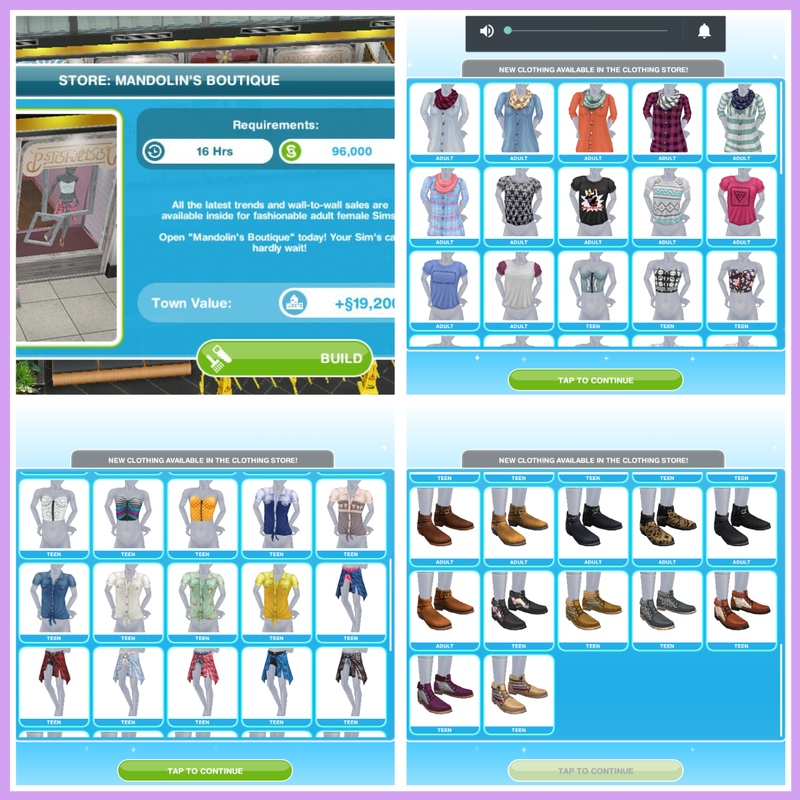 In the maternity store you will find loads of maternity clothes for your pregnant sims as well as brand new nursery furniture! 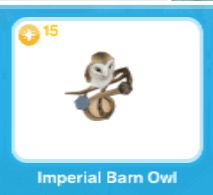 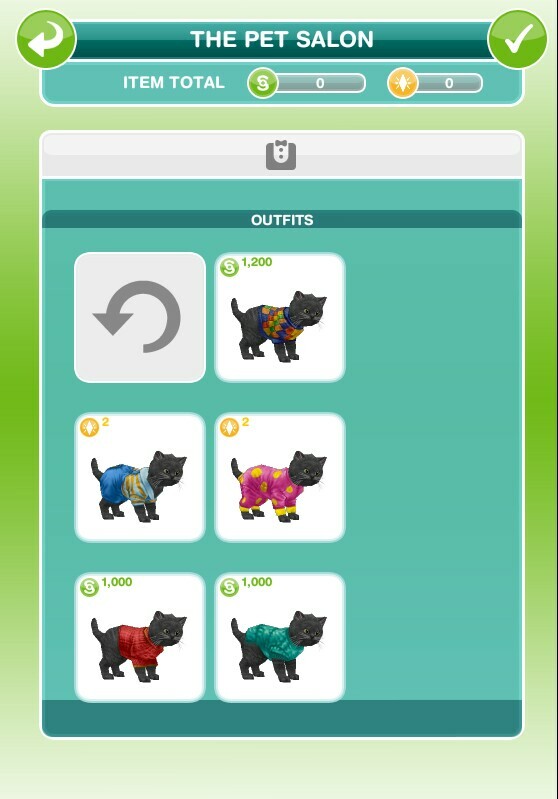 Once the quest is over you can still earn maternity tokens to buy all the items from the maternity store by completing another pregnancy event! 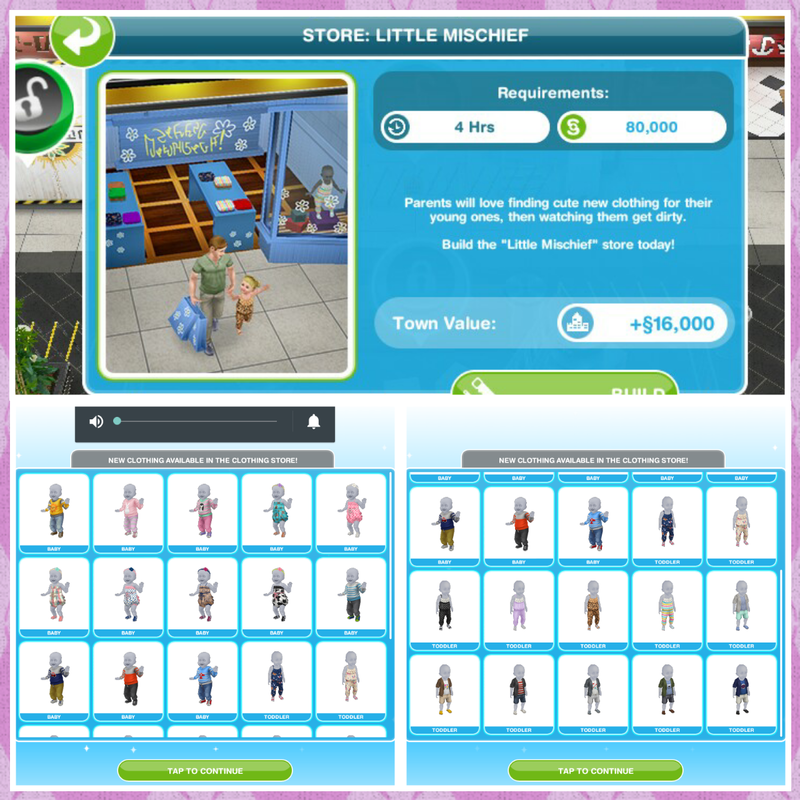 This has been a much requested post, it has just taken me a while to get all the information collected for it! 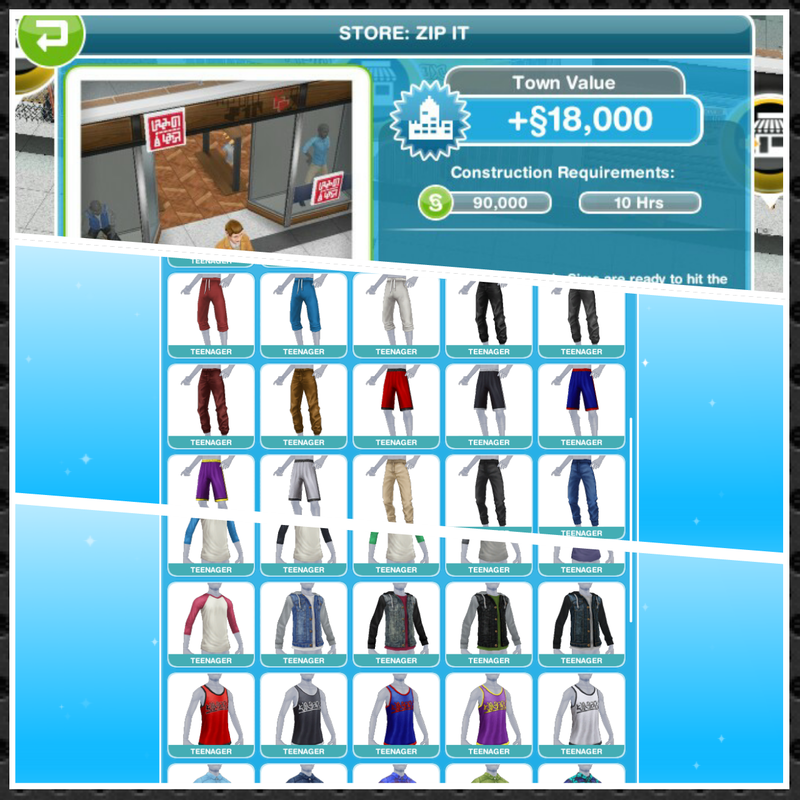 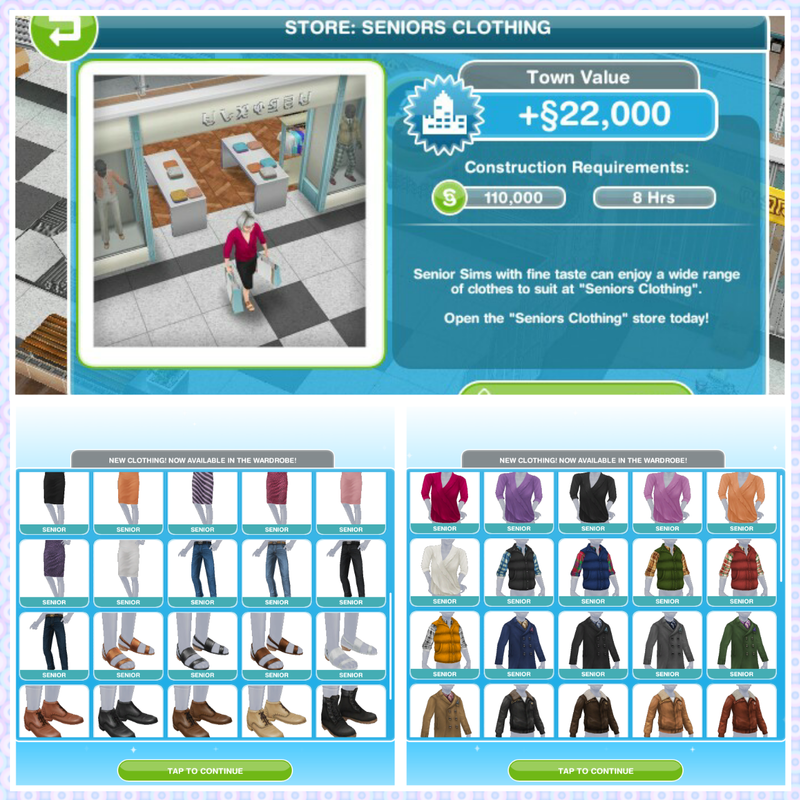 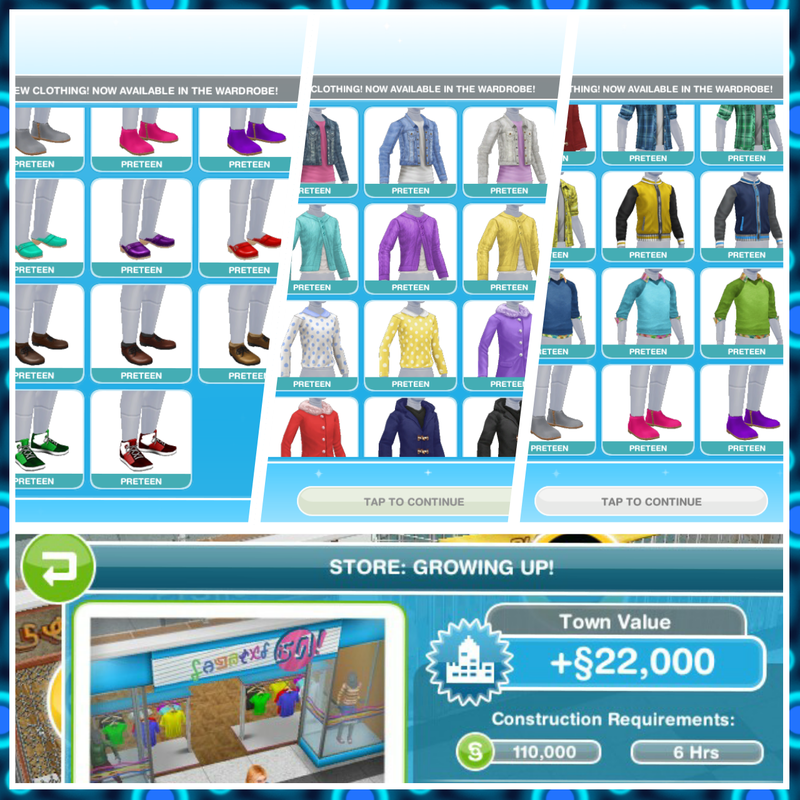 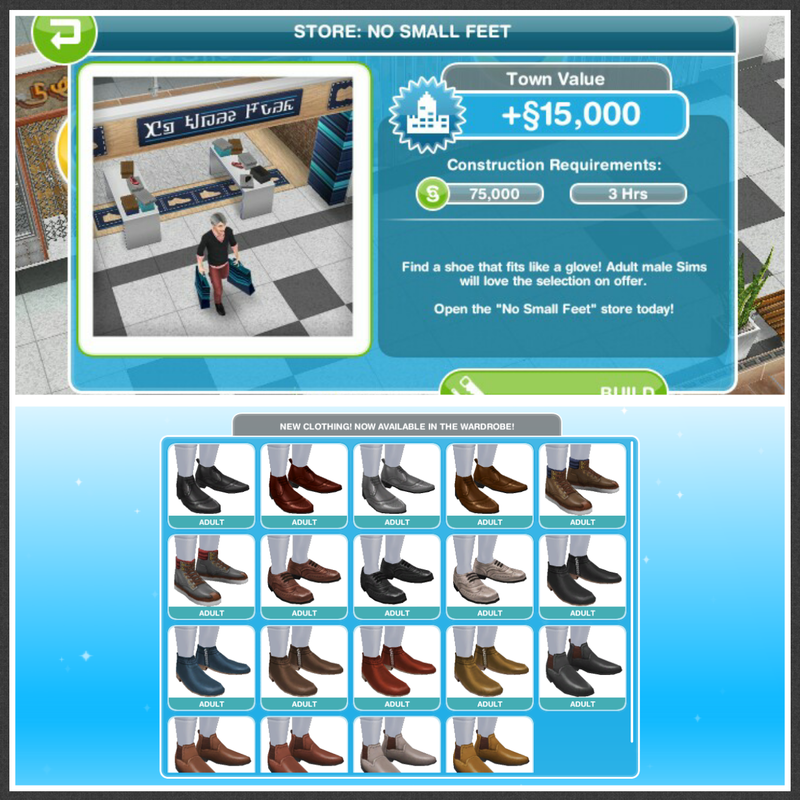 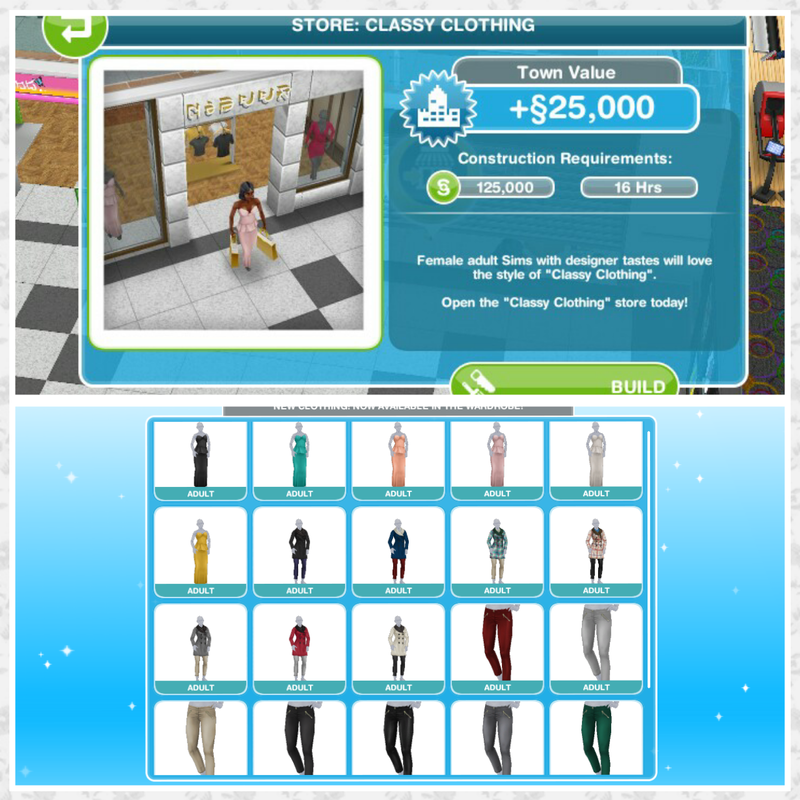 This post shows how much it costs to build each business, the time it takes and how many sims are needed in your town as all three of these factors increase each time you build a business. 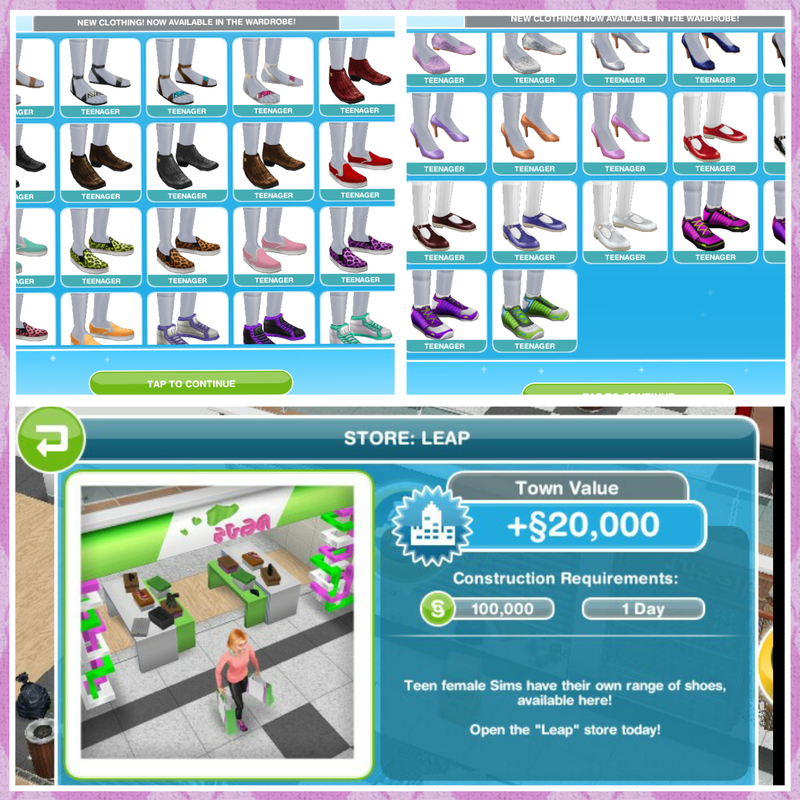 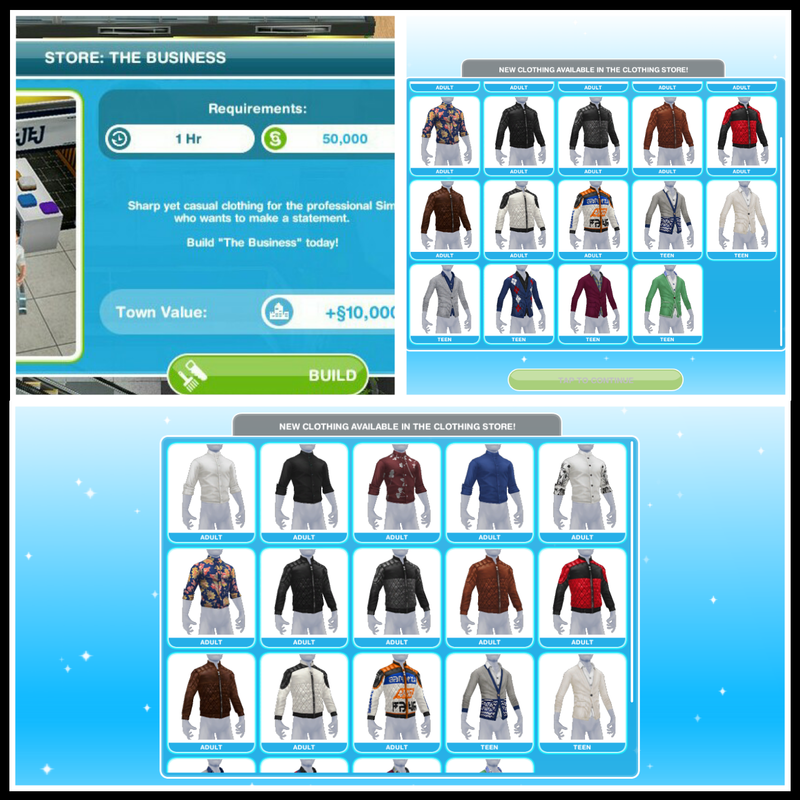 However some businesses that you have to build during a quest or to begin a quest do not follow this pattern, some may be completely different while others such as the Community Center take a certain amount of time to build and this doesn’t change but the cost and sims needed still increase each time you build a business. 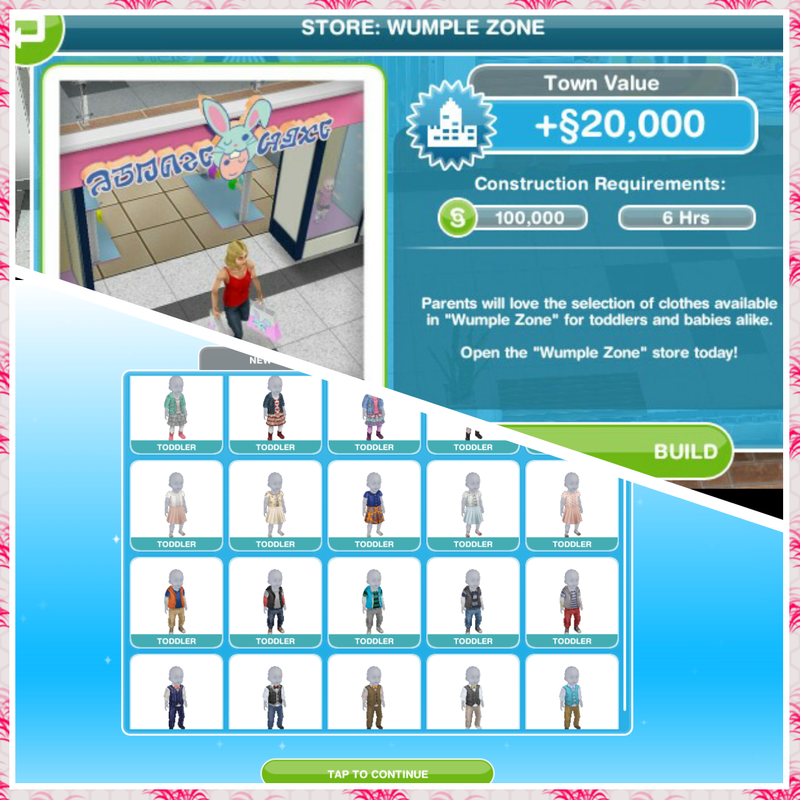 Does building a business increase the price, time and sims needed for workplaces or houses? 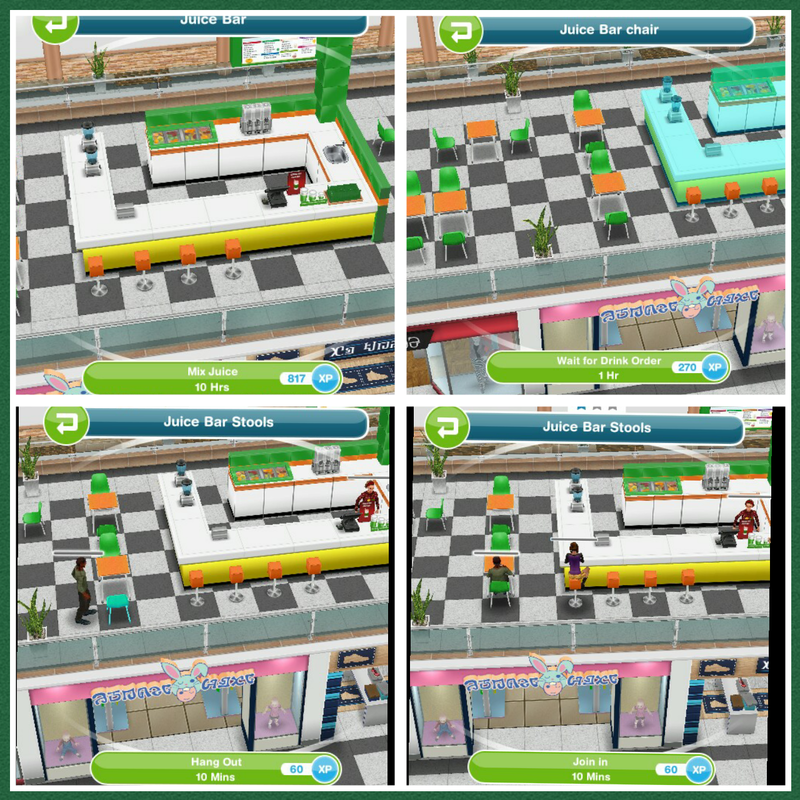 No, building a business only increases the requirements for building another business, it will not affect a workplace or house. 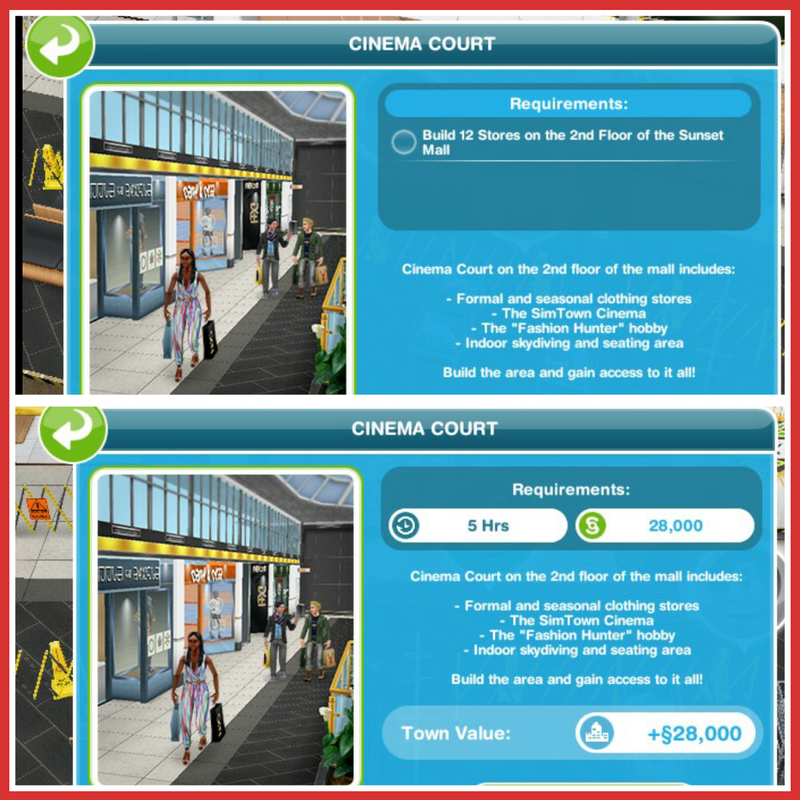 If you build a workplace then the requirements will increase for the next workplace only and if you built a house only the time and cost for building a new house will increase. 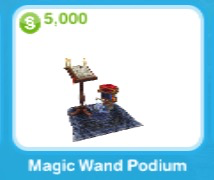 This post is going to show you what can be brought from the sorcerous supplies store. 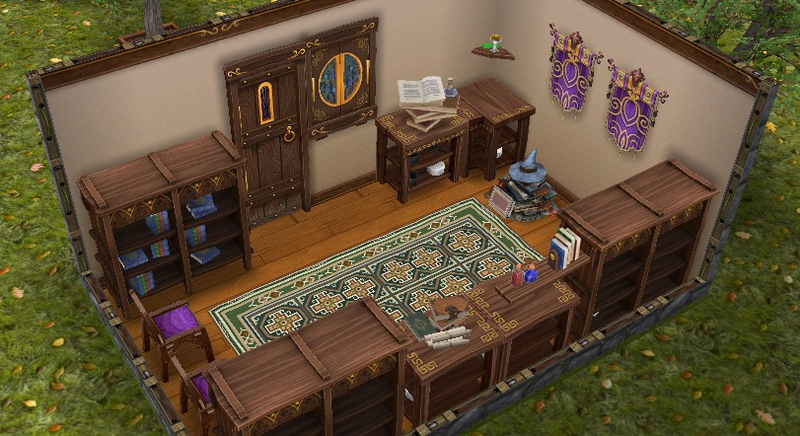 Building the sorcerous supplies store starts the book of spells quest. 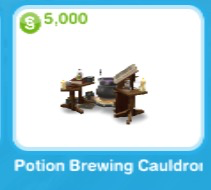 How do I buy an item from the sorcerous supplies store? 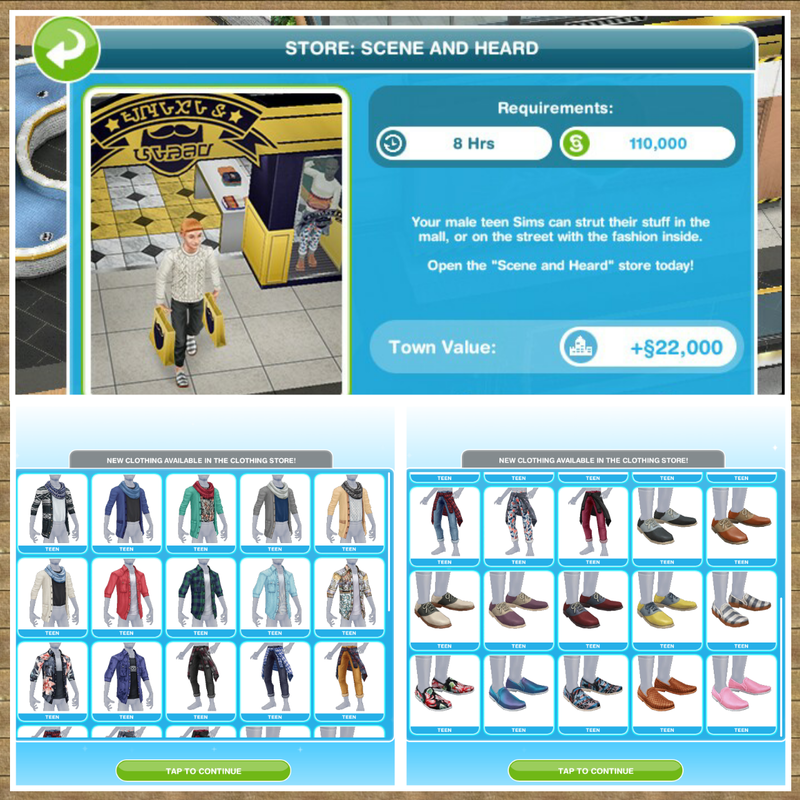 Where can the items be found in the home store? 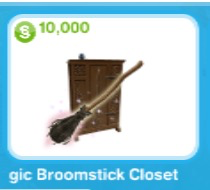 Can all items available in the Wizards Cottage be brought in the Sorcerous supplies store? 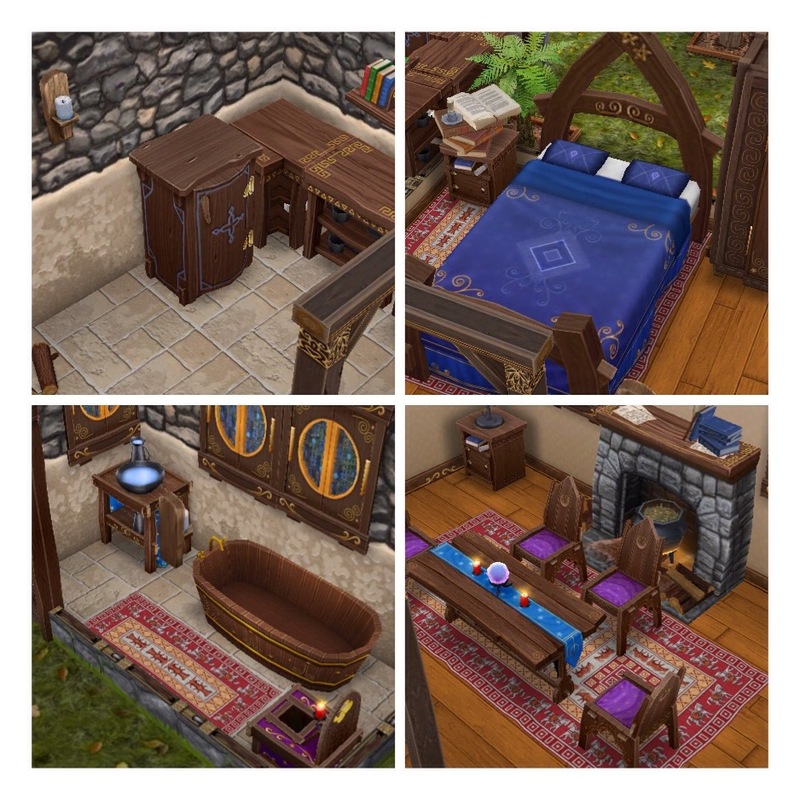 No, most of the furniture such as the bed, bathroom items and dining tables and chairs are unavailable, I will list below what can be purchased and what can only be found in the wizards cottage. 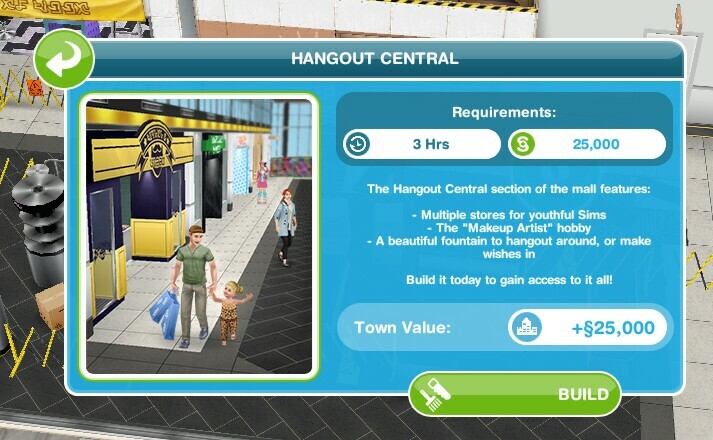 This is going to be a very quick post as there isn’t much to say about the pet salon but I have been asked about it. 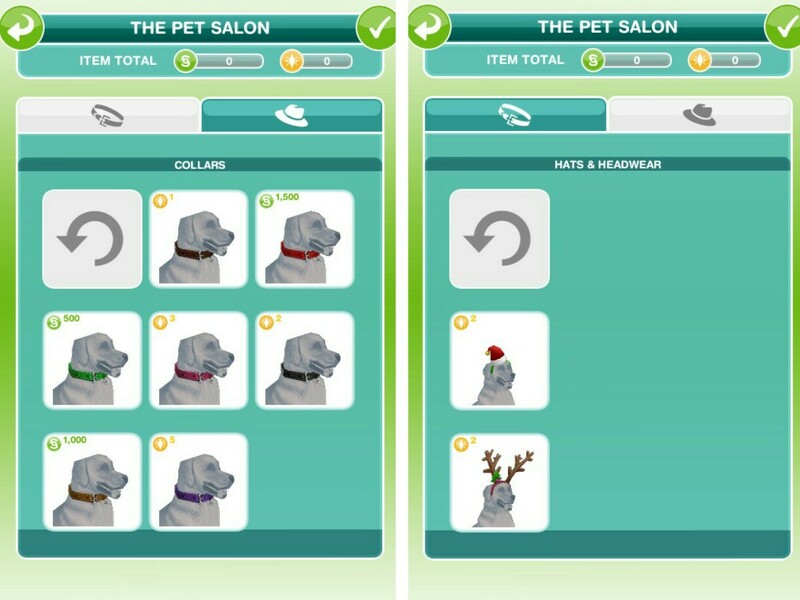 What can you find in the pet salon? 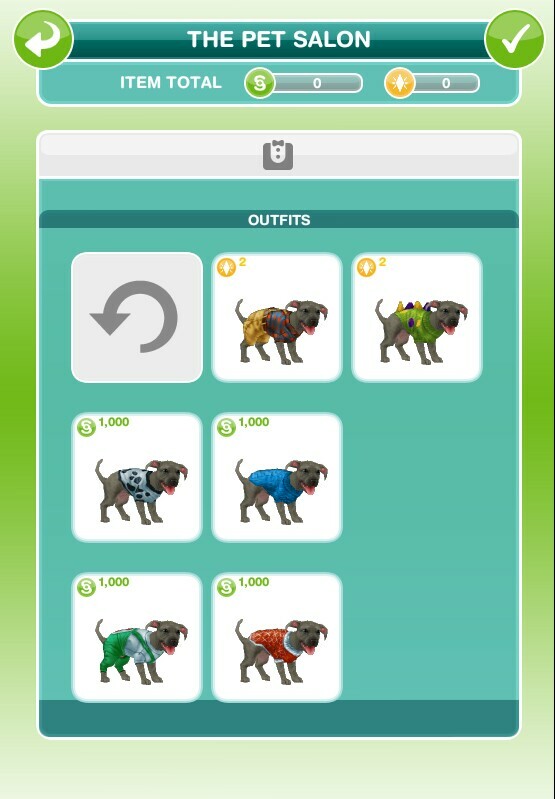 The main reason for it though is to buy collars for your adult cats and dogs so they can go to the Pet Park (which can be built once you complete the life dreams and legacies quest) to complete the Cat Show, Dog Agility and Dog Obedience hobbies! 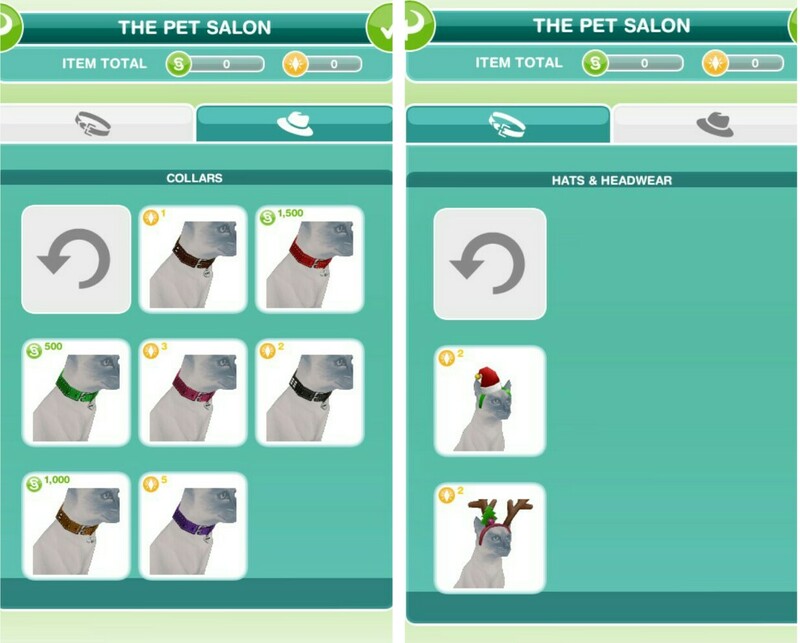 You can also buy Christmas antlers and hats for your adult cats and dogs! 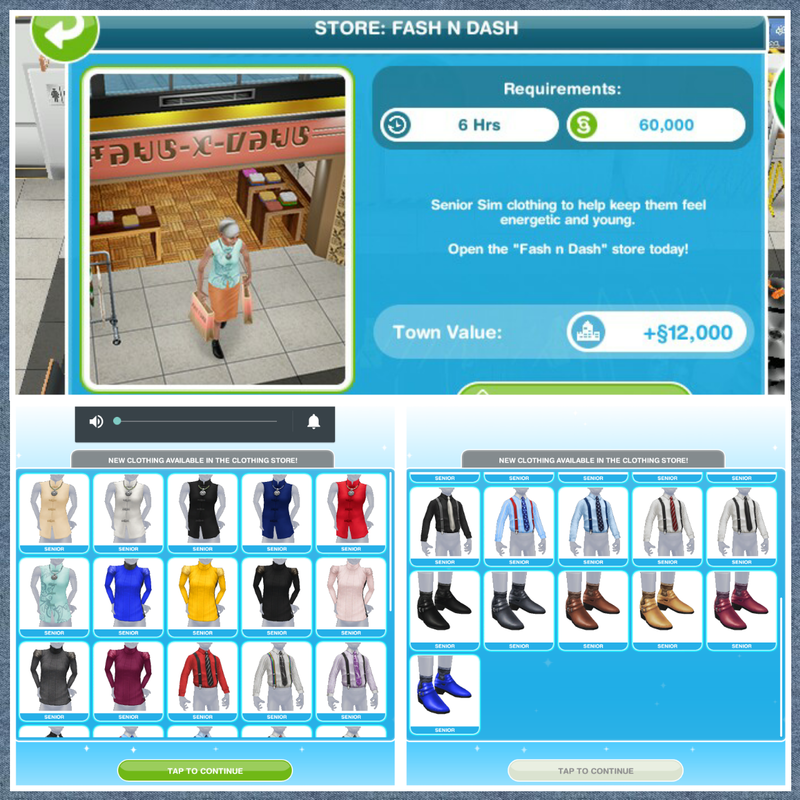 How do you buy items? 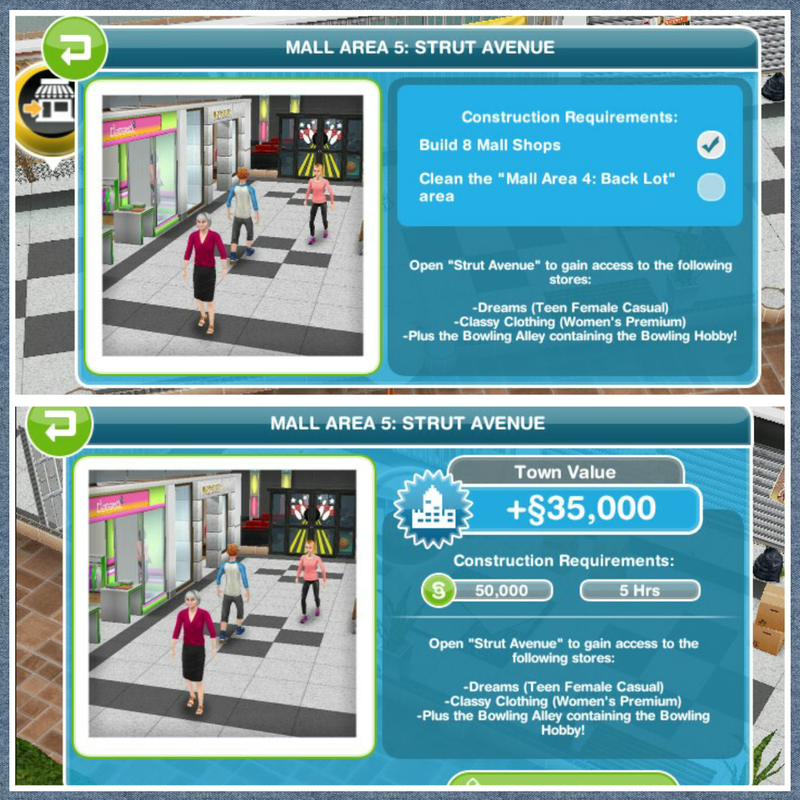 This post will explain all about the mall, the clean up, how to unlock the shops and using the mall. 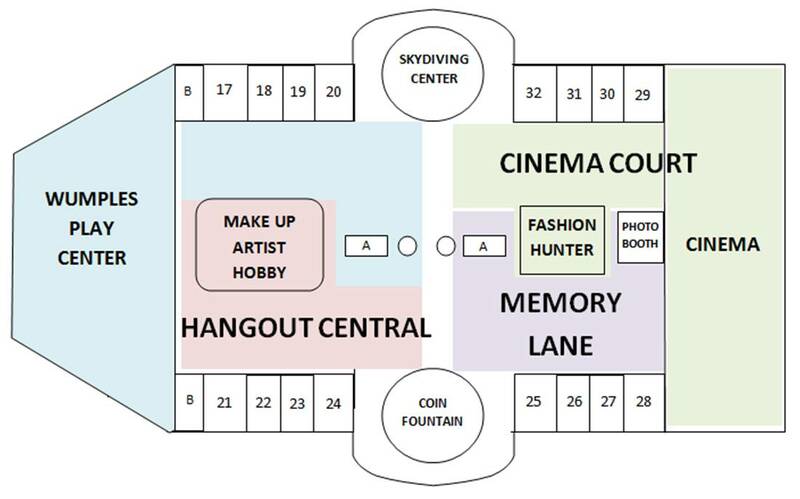 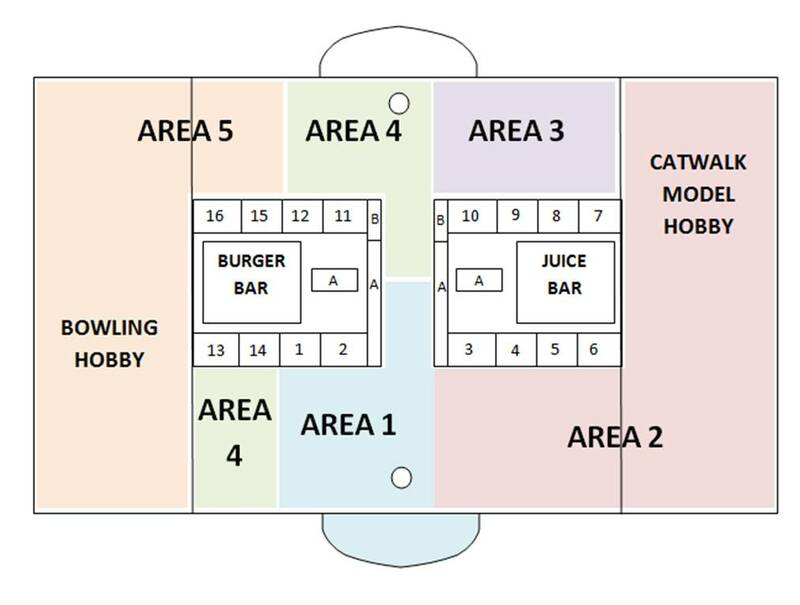 This map will show you where each area is in the mall, below in building the mall you will see the requirements needed for each part. 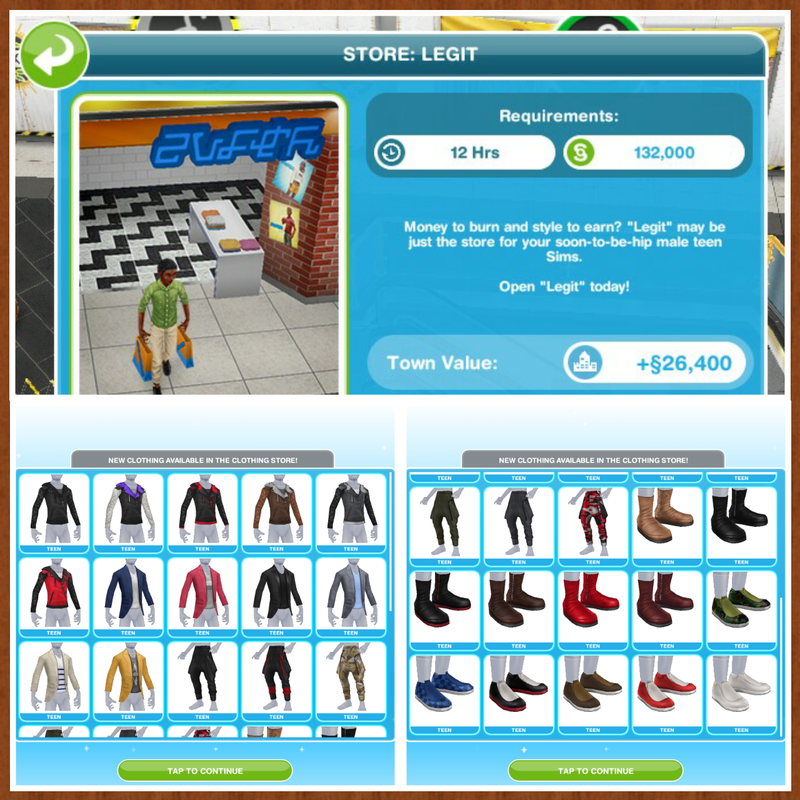 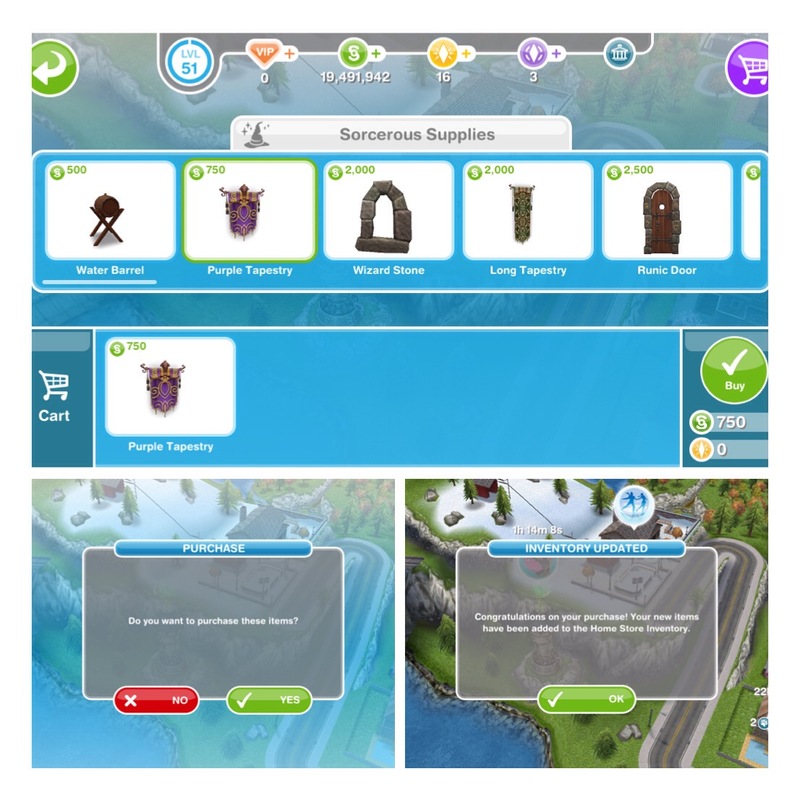 There are 32 shops in total, in the shops section you will see what you can buy from each of these shops and how to unlock them. 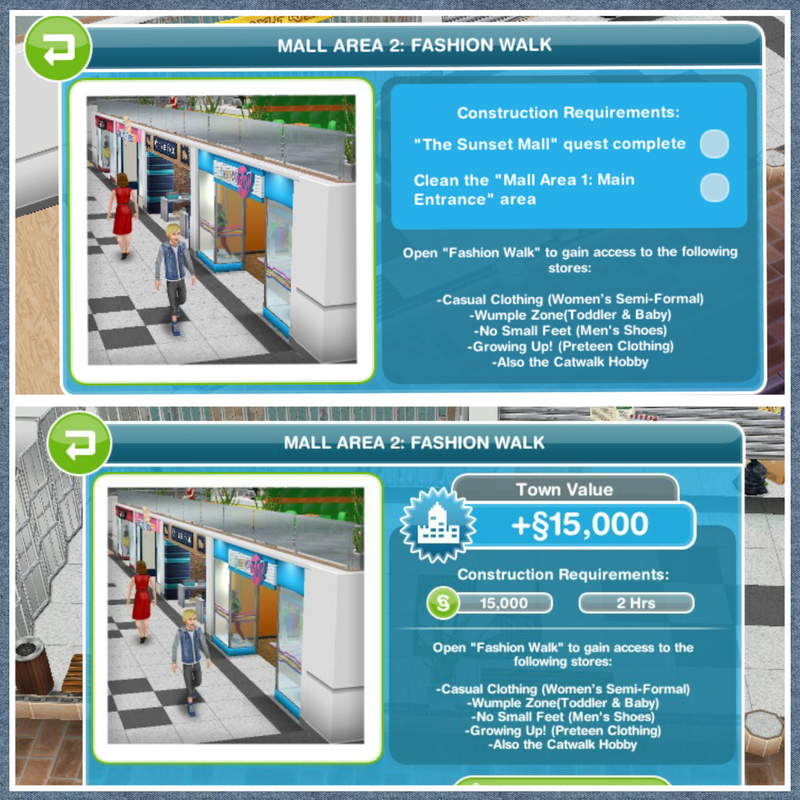 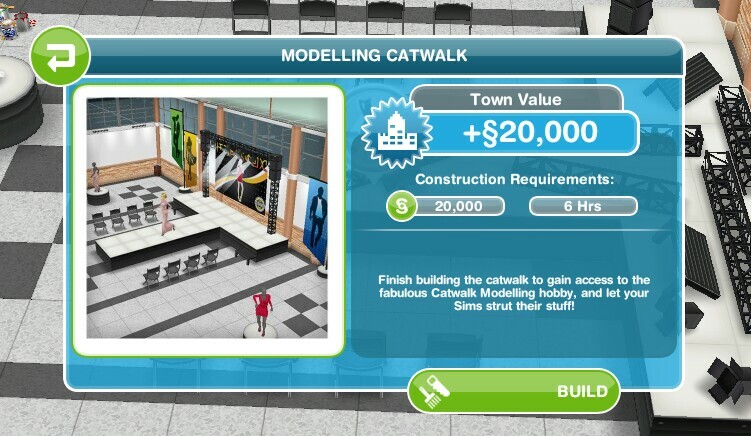 You firstly need to build the mall, then you need to complete The Sunset Mall Quest before you can start cleaning and building the ground floor interior. 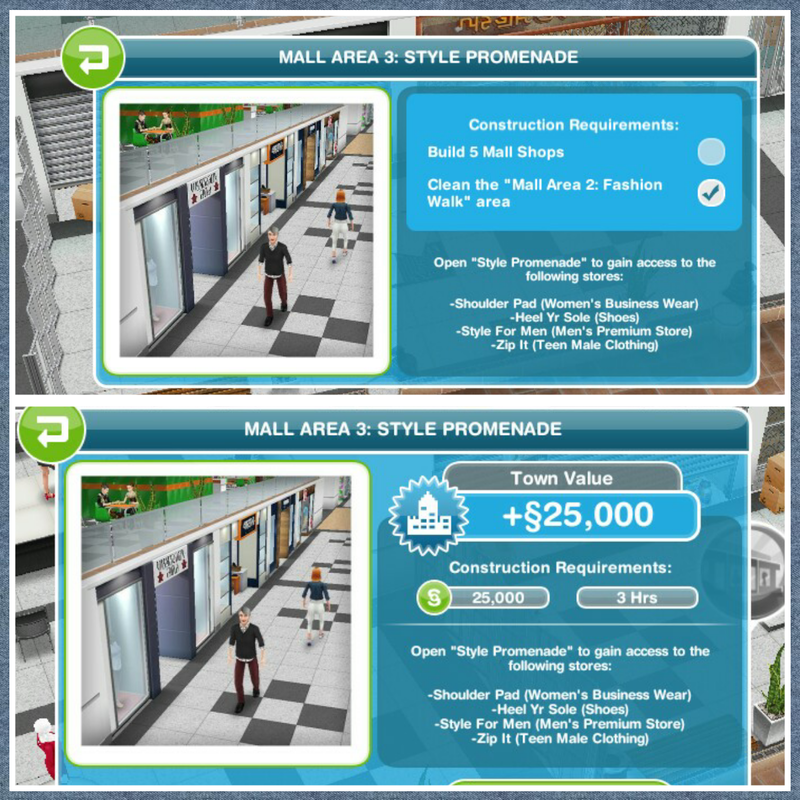 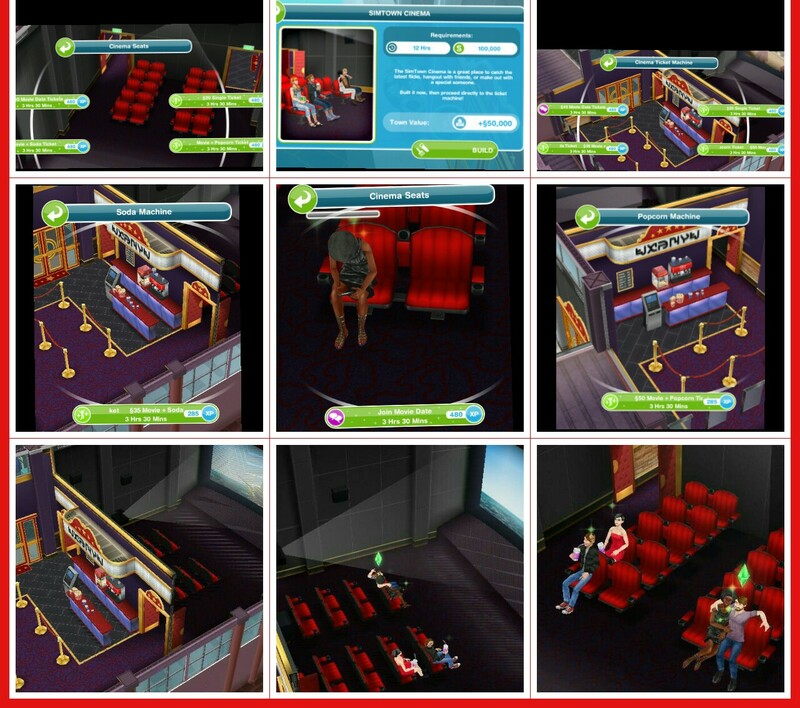 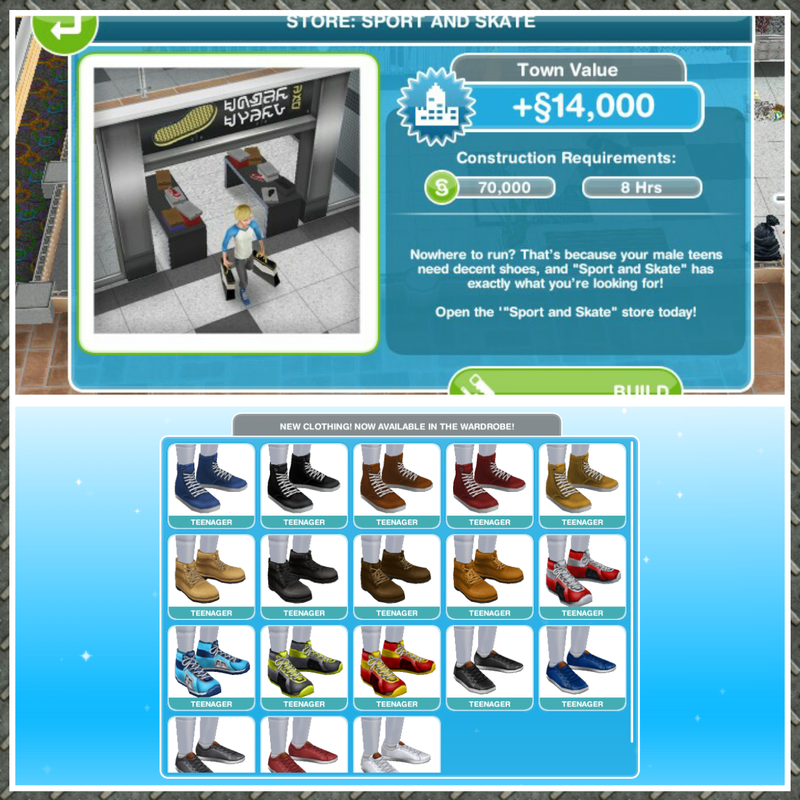 You can have 10 sims in the mall at one time, so the more sims you use the quicker the clean up will be! 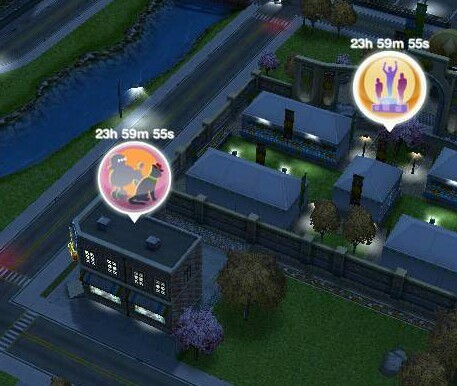 The total time stated on this post would be if you used just one sim. 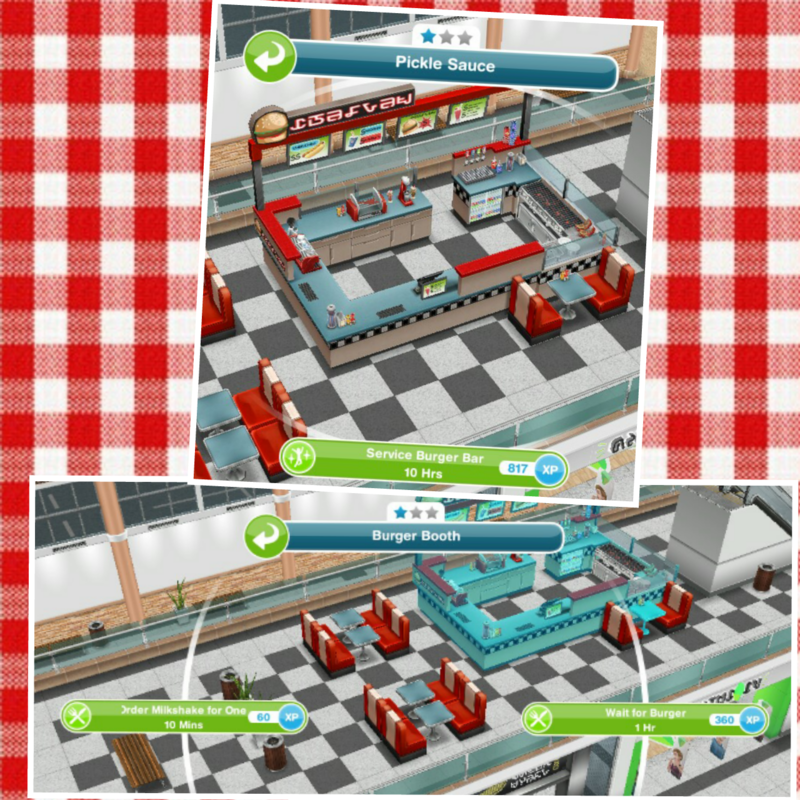 To unlock the burger bar you have to complete the Sunset Mall Quest in the time limit, you can’t get the burger bar if you don’t complete the quest in time- you need to go up a floor (using the upstairs arrow button) to get the option to build the pickle bar, if you can’t see the button you need to have a sim go to the mall. 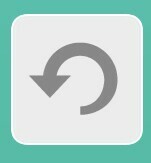 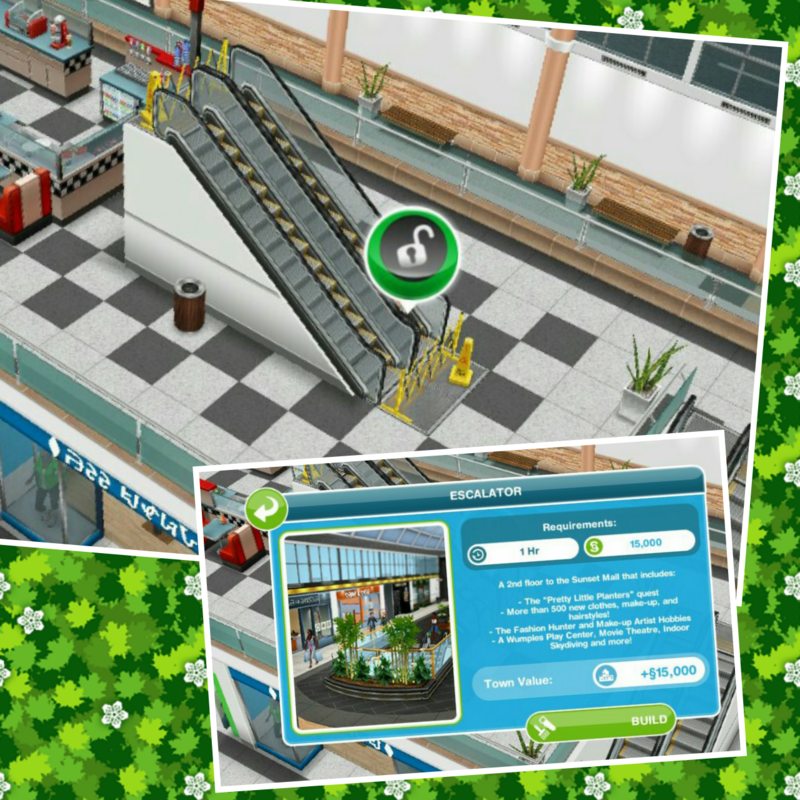 Click on a bench on the left side upstairs as if you want that sim to “rest from shopping.” The icon should appear now. 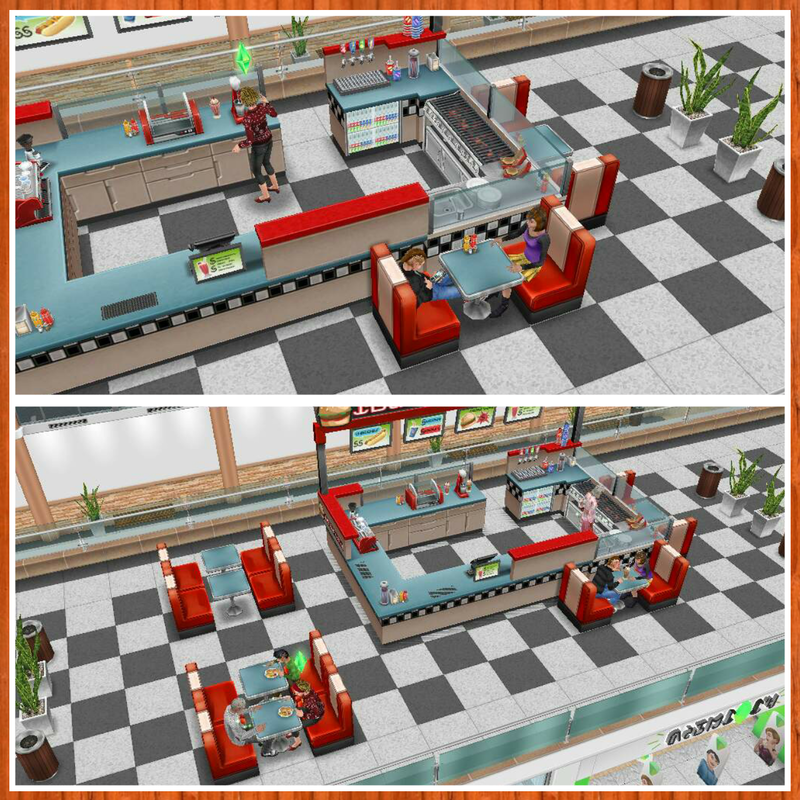 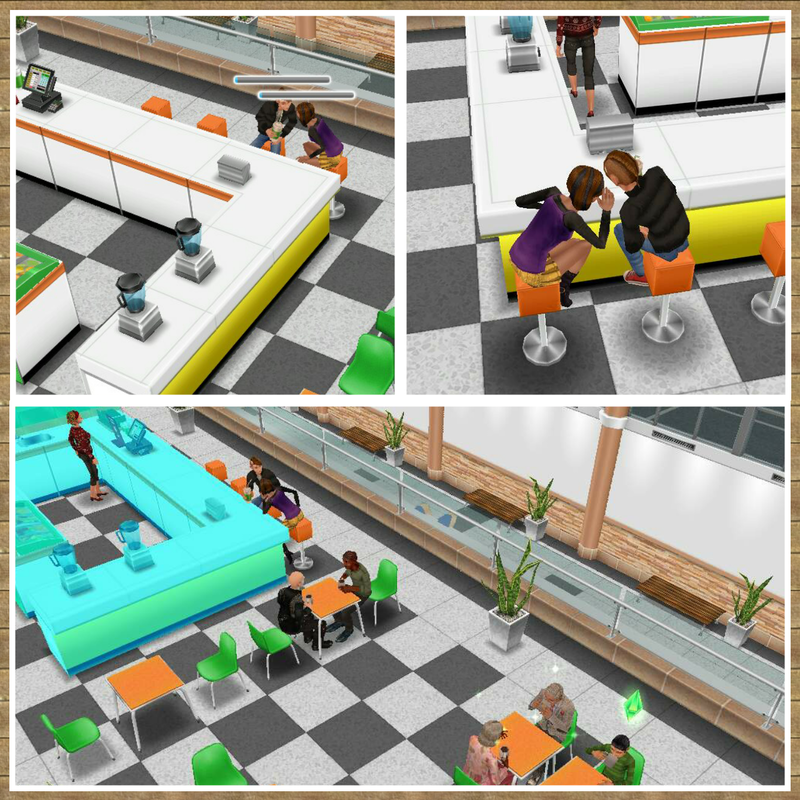 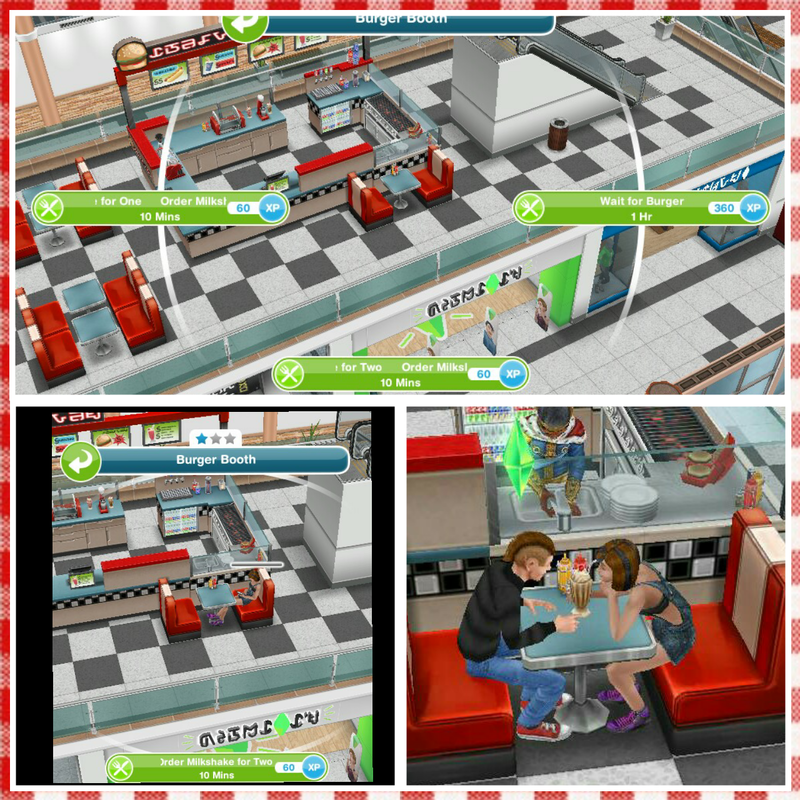 Preteens, teens, adults and seniors can have a milkshake for one but teens can also have a milkshake for two (both teens select milkshake for two option at same table) if you want them to have a milkshake you again need a sim serving and then 2 sims sitting at one table as they share the milkshake. 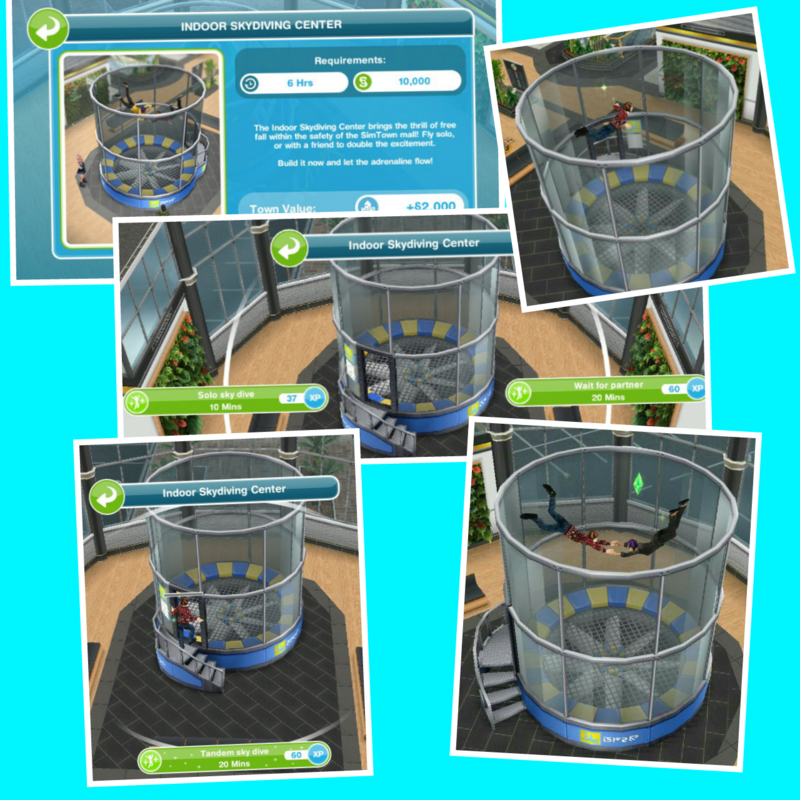 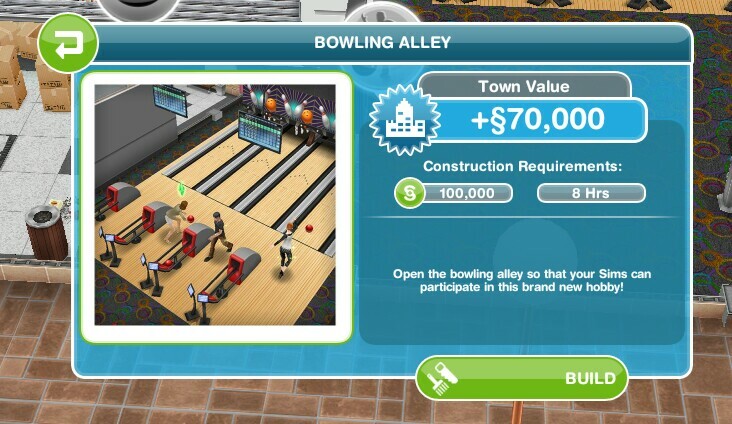 The juice bar is your prize for completing the bowling hobby for the first time- you need to go up a floor (using the upstairs arrow button) to get the option to build the juice bar, if you can’t see the button you need to have a sim go to the mall. 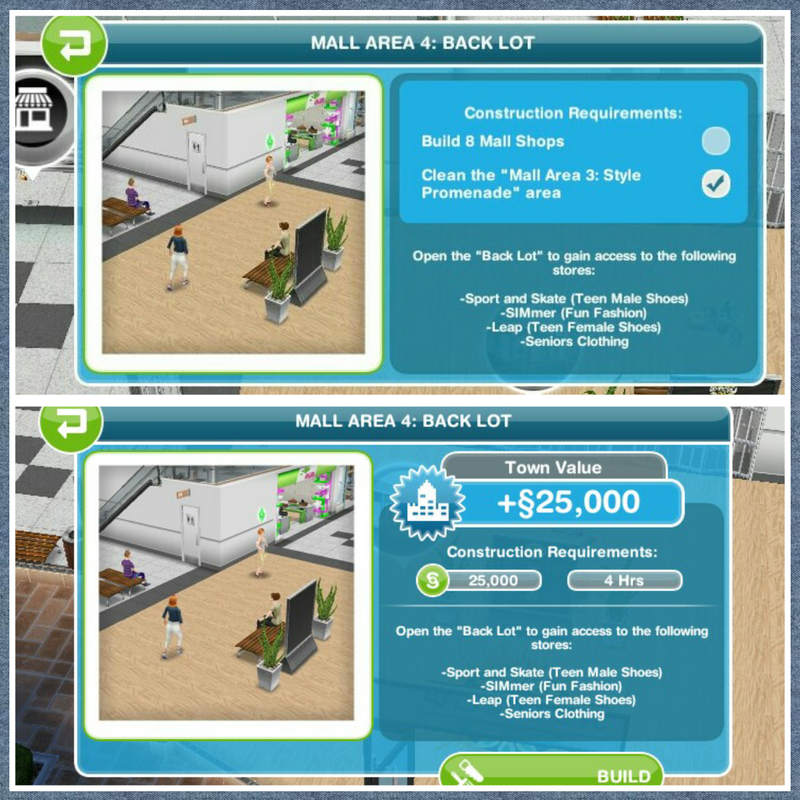 Click on a bench on the left side upstairs as if you want that sim to “rest from shopping.” The button should appear now. 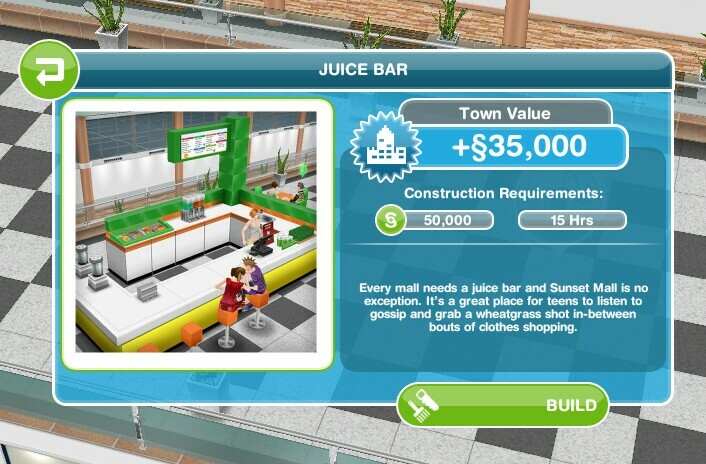 What can you do with the juice bar? 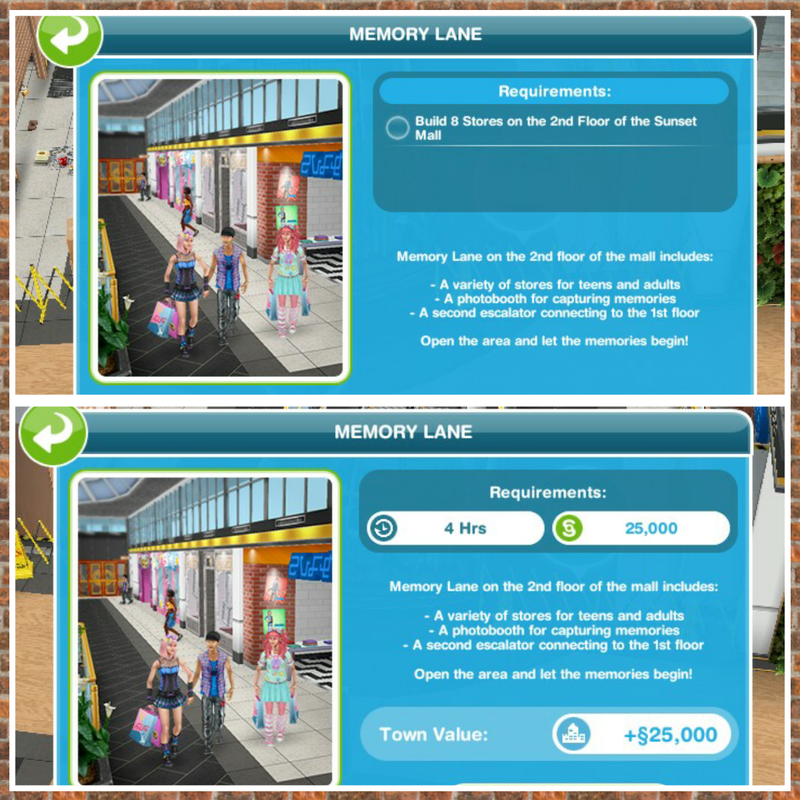 REQUIREMENTS: build Memory Lane to unlock the photobooth. 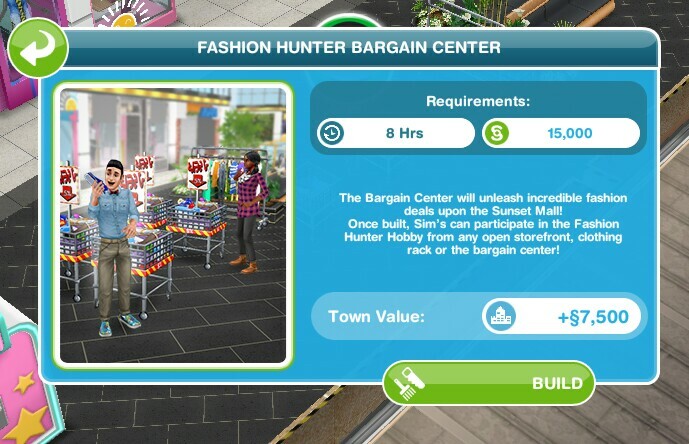 If you complete the Fashion Hunters hobby in the time limit you will unlock the skydiving center. 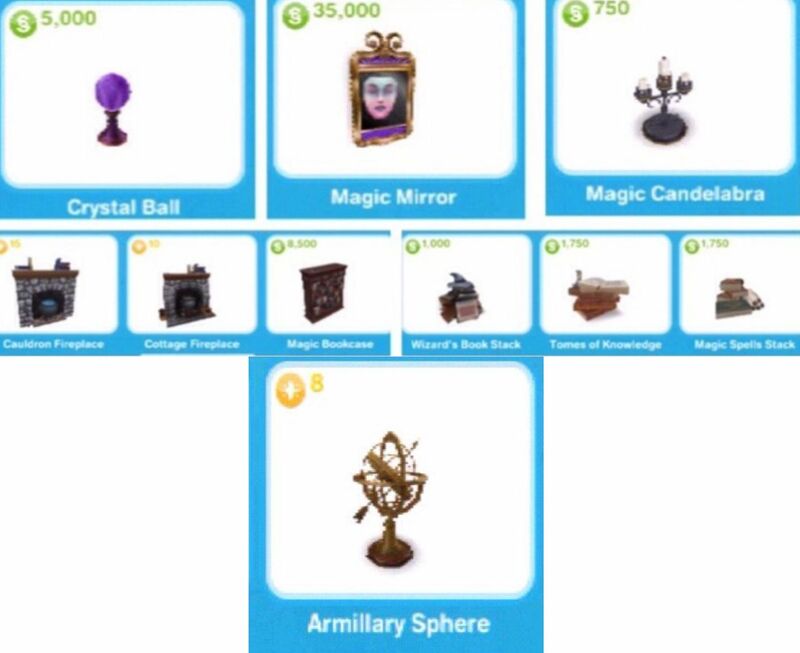 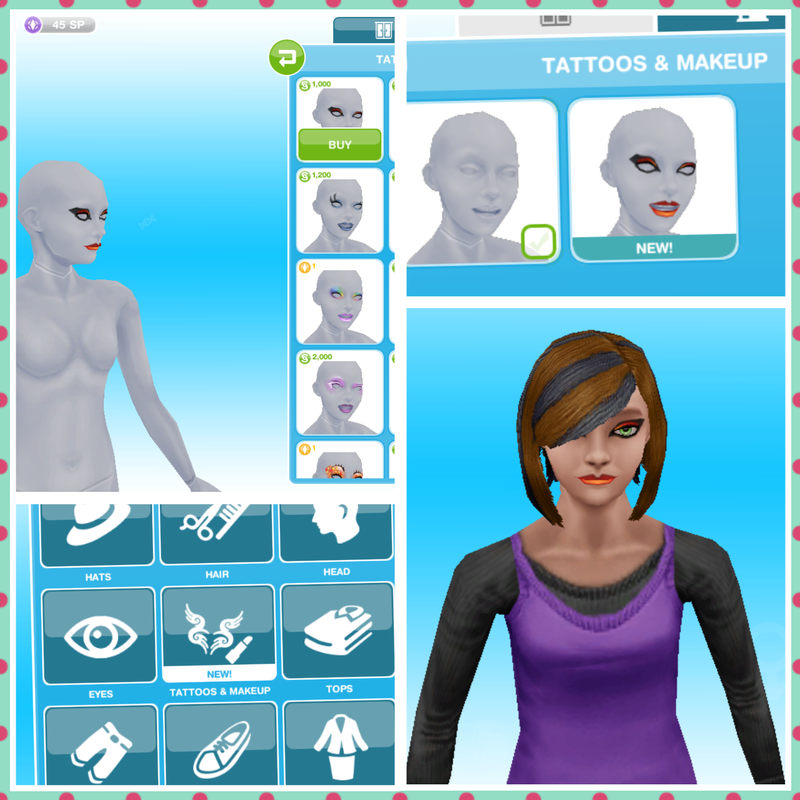 Once you complete the makeup artist hobby you will be able to build the coin fountain. 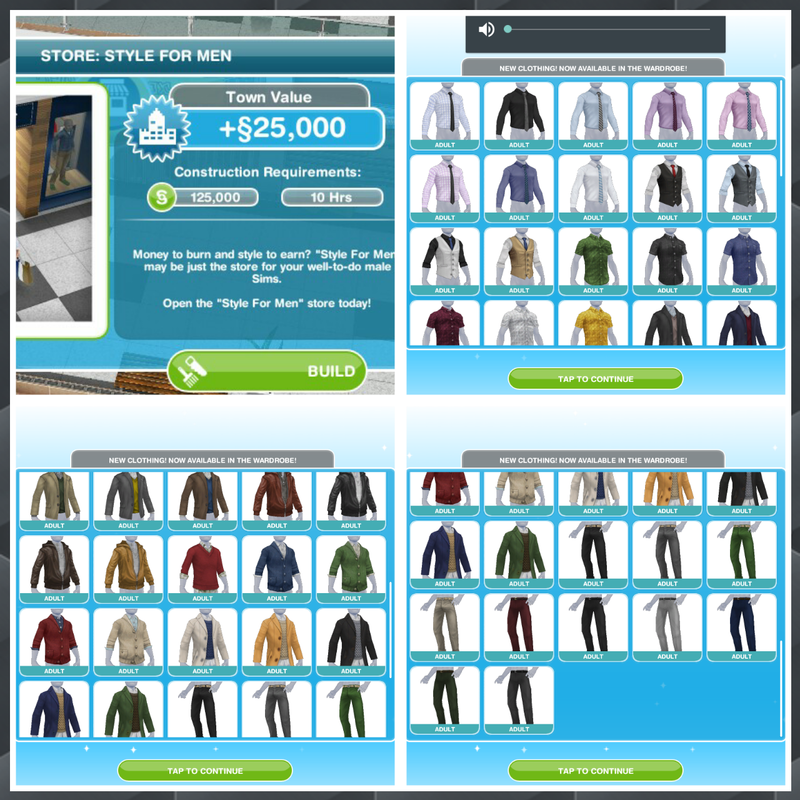 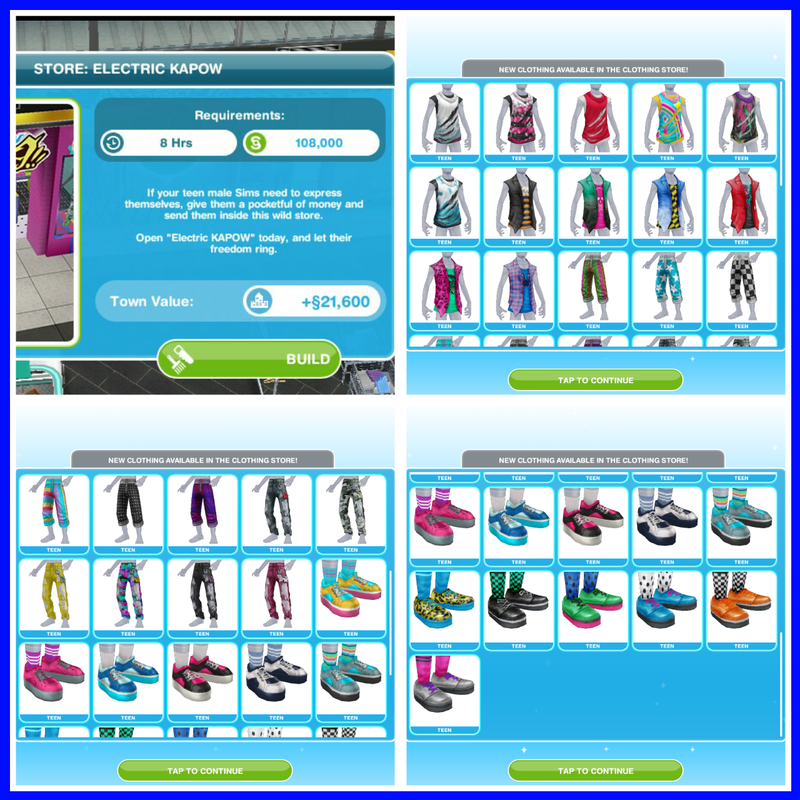 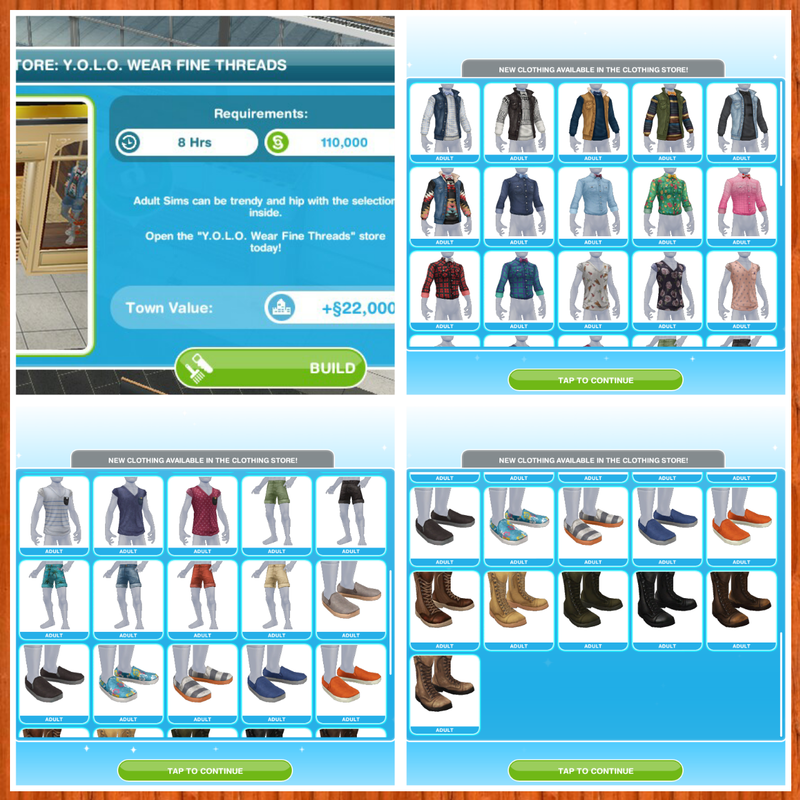 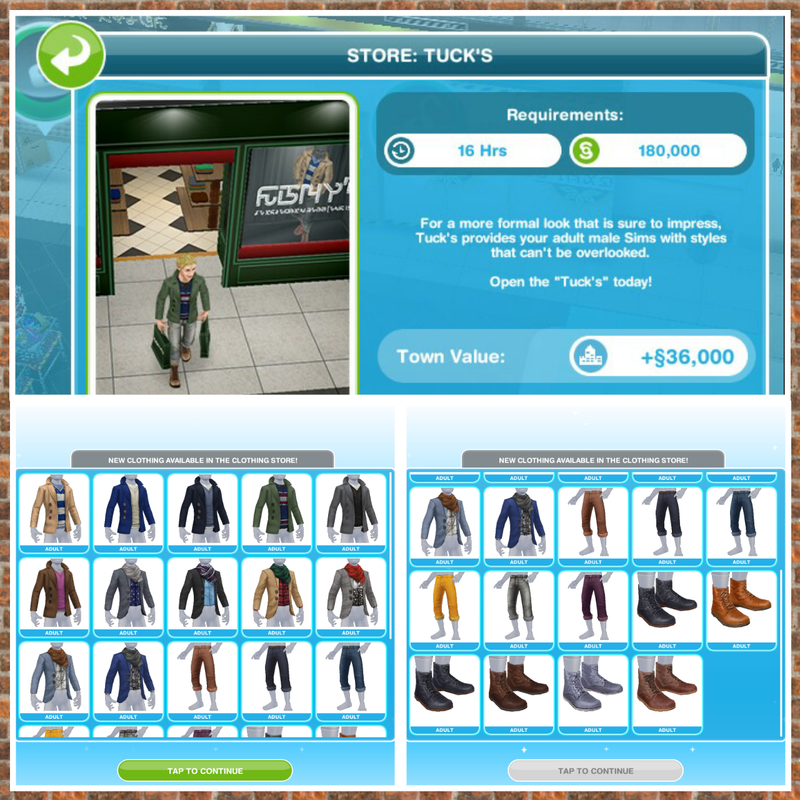 When you buy a new item it is then available in your wardrobe for as many sims as you want (who are of the same gender and life stage) to use at the same time, instead of having to buy the item for each sim like you previously had to.